Log home maintenance is a natural part of owning a log home. It comes with the territory, so to speak. One thing that log home owners often deal with is the presence of insects in their logs. This is more than just a nuisance – it may be an indicator of rot in the logs. 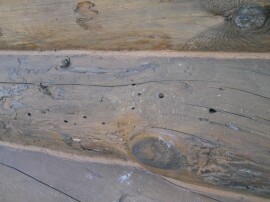 Once the rot was cut out of this log, look what we found – carpenter ants! The most common insect in log homes is the carpenter ant. 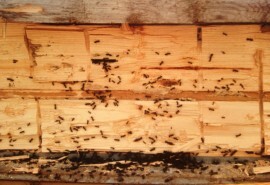 The carpenter ant infests wood that is rotting, although they do not cause the rot. The holes carpenter ants bore are about ¼ inch in diameter. Powderpost beetles are also common in log homes but they generally don’t do structural damage and are most times not the best indicator of rotting wood. Their holes are more the size of a pencil lead. Neither of these insects do structural damage to the logs themselves but carpenter ants may be a warning sign to you that your logs are getting wet or have some rot in them. Part of the defense against these insects is boron compounds. Borate works by raising the Ph level of the wood to the point where the rot organism is impeded, and subsequently the bugs are less able to attack it. Bottom line – most times boring insects indicate a larger problem with rot. If you are concerned about insects in your log home, give us a call at 715-373-5744 or send an email to info@restorelogs.com. Don’t let the insects get the best of your log home!